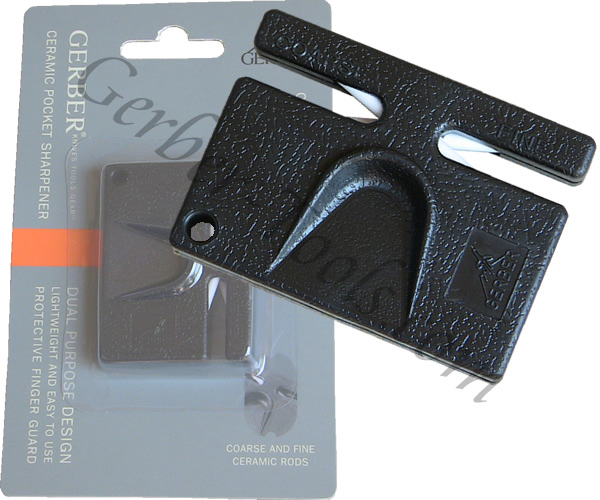 Gerber Ceramic Pocket Sharpener 04307. It will sharpen your knife to a razor sharp edge in just a few minutes. It is small enough for the palm of your hand and fits on your keyring. One side of the pocket sharpener has coarse ceramic and the other side has fine ceramic. Drag your blade through the coarse side then drag through the fine side to get a sharp edge. This sharpener is pretty amazing. You need not have any experience to use this sharpener. Simply drag the blade through and the knife gets sharp!